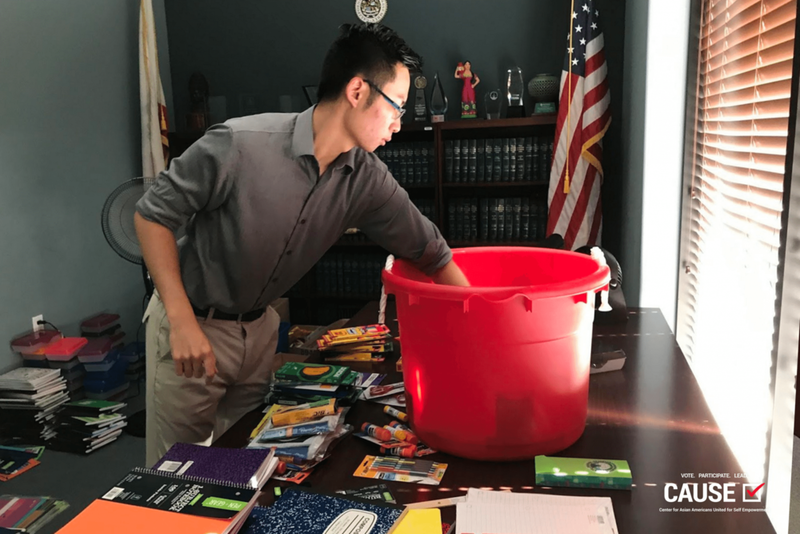 While reflecting on my internship experience with Assembly Speaker Anthony Rendon, I had the opportunity to end my last week by helping out with a backpack donation drive. After filling over 400 backpacks with supplies, the end result was rewarding. Witnessing the joyful children with their new backpacks made the hard work all worth it. I realized that little things like backpack donations can be instrumental in removing some of the barriers that often stands in the way of students and their learning potential. It is through this donation drive that I learned the true meaning of public service. The donation drive and all of the work leading up to this event was the perfect culmination to my internship experience. Thanks to the many lessons I learned, I ended my internship knowing much more than before. In the process of organizing materials for the backpacks, I got to meet staffers from the Capitol Office. Working alongside them on a hot summer day was memorable. Anna Goddard, the Director of Speaker Rendon’s Office Protocols and a fellow aggie helped expedite the organization and inventory process in an efficient manner. Anna had the energy that empowers and inspires and I knew she was just the type of person I wanted to know for the long haul. I confidently asked for her business cards, made sure to send her an email, and received a call from her a moment after. And just like that, I had expanded my network. It felt great to put the networking skills I learned from CAUSE into practice with some of the Capitol staff. While working on the backpack donations, I continued to answer phone calls. Like the last eight weeks here at the District Office, I greeted each call with, “Hello, this is Assemblymember Anthony Rendon’s Office. How may I help you?” After more than 400 calls, I improved my listening abilities and my communication skills. With the heated issue over Assembly Bill 562 early in my internship at the District Office, I was fortunate to listen to countless of stories and learn the different hardships and needs of people across the spectrum. Any time I was faced with finding a solution to questions I did not know how to immediately answer, I quickly learned to ask for and research the appropriate answer to give to concerned callers. One of the most important things I gained from this internship was learning from my mistakes. I was quite blessed to work with staffers who watched my back, advised me on difficult phone calls, and wanted me to always be better. I can testify that this internship taught me the value of failure. Acknowledgement and acceptance of failure help fuel improvement. By the end of my time at the District office, I gained perspective on what a public servant’s life is like. It encompasses back to back scheduling; meetings with community leaders and constituents; district events; and so much more. Shockingly, it is only half of the duty of a public servant. From Monday to Thursday, they are in the California Capitol legislating, attending committee hearings, researching bills, and voting on them. Running for office is one of the few career aspirations I have in mind. Luckily, through this internship, I had the access to explore the possibility of seeing myself in this role. I now have better understanding of one of my potential career paths. CAUSE has taught me to always explore. Our future careers do not have to be bound by our majors. Because I am now more educated on the duties of a public servant serving in the district, I am now interested in learning more about their duties in the Capitol. As I crossed the finish line at my internship placement, there are no words that perfectly describe my gratitude for the opportunities for growth I was given. I came into the program quite numb of all the politics. Nevertheless, the opportunities I was given from my district supervisor, Veronica, has been instrumental to reigniting my passion for public service. The chance to listen to constituents, the trip to explore the importance of the Port of Long Beach, and the access to observe the duties of a public servant. My time at the office has redefined my perspective. I am grateful to have had Veronica as my intern supervisor, and I am equally grateful for CAUSE for connecting me to opportunities I could not have ever imagined.